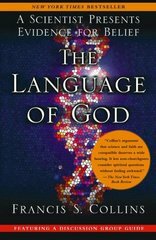 The Language of God 0 Edition An instant bestseller, The Language of God provides the best argument for the integration of faith and logic since C.S. Lewis’s Mere Christianity.It has long been believed that science and faith cannot mingle. Faith rejects the rational, while science restricts us to a life with no meaning beyond the physical. It is an irreconcilable war between two polar-opposite ways of thinking and living. Written for believers, agnostics, and atheists alike, The Language of God provides a testament to the power of faith in the midst of suffering without faltering from its logical stride. Readers will be inspired by Collin’s personal story of struggling with doubt, as well as the many revelations of the wonder of God’s creation that will forever shape the way they view the world around them.